If you are looking for wooden garden fencing ideas, then you’ll find this page helpful. Acacia Gardens specialise in Fence installation London for our customers. To help clients decide which types of wooden garden fencing is best for them we have compiled this guide. 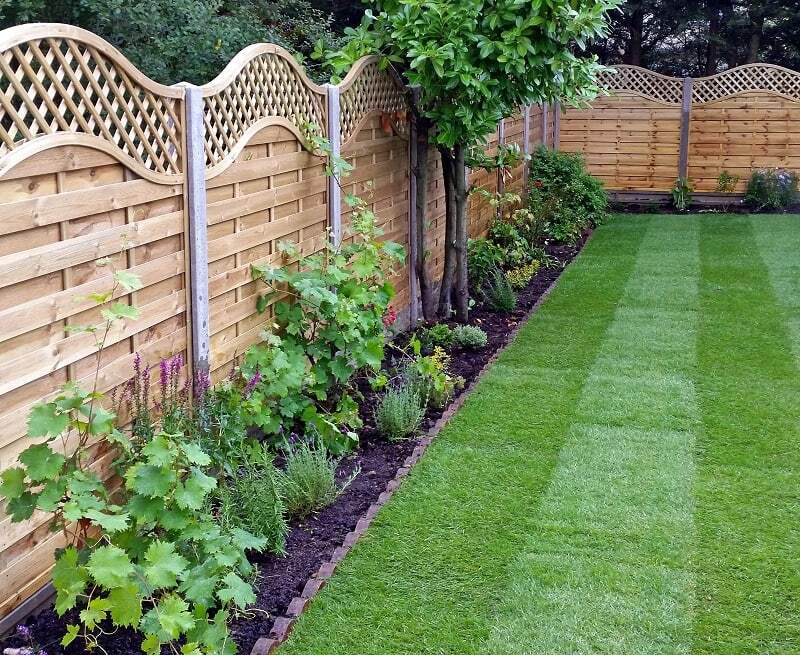 If you are looking for wooden garden fencing ideas including back garden fences,front gardens fences, traditional or contemporary fence solutions or a garden trellis, see the pictures below for inspiration. If you have something particular in mind, Acacia Gardens can create and construct bespoke fencing which we can stain or paint accordingly. Overlap Fence Panels: A neat design with simple clean lines. These panels have an additional upright batten on each side to increase strength and therefore stability. These panels are great for privacy and security purposes. Closeboard Fence Panels: These have a heavy duty appearance. The wooden boards on these panels are very close together with no gaps. This means that you have more privacy. They also have a frame all around each panel which makes them strong and secure. Feather Edge Fence Panels: These feature a swan feathered edge clad panel. With extra horizontal battens you get additional strength. Ideal for both privacy and security fencing. Tongue and Groove Panels: For these panels, the adjacent boards are joined together via interlocking ridges and hollows down their sides. Ideal for both security and privacy. Hit and Miss Fence Panels: The pales along the panel alternate with one towards the front and the other towards the back. The pales could be horizontal or vertical. You can also opt for chevron patterns or convex tops for added interest. Slatted Fence Panels: These panels provide are ideal for those wanting a contemporary fence. The wood is placed horizontally with small gaps in between. This gives you some privacy but also allows the light in. The wood is smooth for a contemporary finish. The panel can be stained or painted a dark colour to give a dramatic effect. Venetian Fence Panels: The horizontal pales have a slight gap in-between. This allows light to shine through so the garden doesn’t feel too closed in. You get less privacy but more light. Woven Fence Panels: As the name implies, these panels have a horizontal inter-woven effect. The panels let light thought so are less private but are very attractive. They are less sturdy than the closeboard type fencing. Picket Fence Panels: This fence is made from spaced uprights which are connected with horizontal rails. There are different variations available including a crescent top which dips in the middle. These are typical front garden fences with a cottage feel. Trellis Panels: If you require screening in your garden rather than a traditional fence panel, you can also consider using a trellis. This is ideal if you wish to grow climbing plants for decoration. You can also use trellis panels on top of low brick walls to provide additional screening for your garden. Fence Panel Tops: Fence panels can be finished off with a trellis on top. Some have a straight edge whilst others are concave or convex designs. Concave features a curved dip at the top and convex has a prominent curved top. Fence Posts: When building a fence, an important part of the construction is the type of fence posts used. This varies according to the panels, the condition of the ground and the appearance. Posts are usually wood or concrete and sometimes made from metal. Concrete posts will last longer and are more sturdy so ideal for heavy panels. Wood posts will require some maintenance in the future. The benefits of a back garden fence include privacy, security and decoration. Before you decide on a fence panel design think about your reasons for having the fence; do you want privacy, security or both. Do you have a dark garden and require light to shine through? Do you want your fence to provide additional decoration? Best Wooden Fence Panels for Security: Closeboard, Overlap, Feathered Edge and Tongue and Groove and Hit and Miss. Best Wooden Fence Panels for Privacy: Closeboard, Overlap, Feathered Edge and Tongue and Groove and Hit and Miss. Best Wooden Fence Panels for Letting Light Through: Venetian, Woven and Slatted. Best Wooden Fence Panels for Decoration: Venetian, Woven and Slatted or opt for a security panel with a concave or convex top. The benefits for front gardens include defining your boundaries and giving your home kerb appeal. For front gardens customers often have a sturdy and closeboard type fence in between their property and the neighbouring house. At the front of the garden a lower fence is often selected. This can either be a stand-a-lone fence or one on top of a low brick wall. We have found that the most popular fencing for the front portion of a garden is picket fencing. Picket fencing marks out your land boundaries but gives an open feel. It is also great for showing off your floral displays. This can either be stained or painted traditional white. Getting the Fence Height Right: In terms of fence height, it is always best to check with your local authority to find out how high you are allowed to have your fence. Knowing Your Boundaries: Your fence should be within your boundary so it is advisable to check exactly where that is. You might find this website useful www.gov.uk/your-property-boundaries. Informing Your Neighbours: In the spirit of being a good neighbour, we recommend that you inform the people next door to your property that you are going to install a fence. If your gardens are right next to each other there will be disruption on their side. Quality of Work: The fence will last longer if you have it properly installed by a professional. The fence posts need to be placed and secured firmly in the ground. The panels must be attached securely to the posts. In the UK we often experience strong gusts of wind which could blow a fence over. If you are interested in a wooden fence for your garden, please call Acacia Gardens today on 020 8800 3866 or contact us here. We can help you choose and decide on the best type of fence panels to suit your requirements, property and budget. You can find inspiration for wooden fences on our Garden Fence Pinterest Board which shows a selection of fence photographs gathered from the internet.